Cisco's struggles with heavy resistance will likely intensify following this morning's downgrade from BMO Capital. Cisco (CSCO - Get Report) is off a bit this morning following a downgrade from BMO Capital. Yesterday the stock reached new 52-week highs, by a very slim margin, before fading late in the day. The stock's struggle with heavy resistance near the $34.50 area, which began in late February, is beginning to look like a losing battle. The combination of today's negative news and a downside reversal near major supply may mark an important top, at least in the near term. 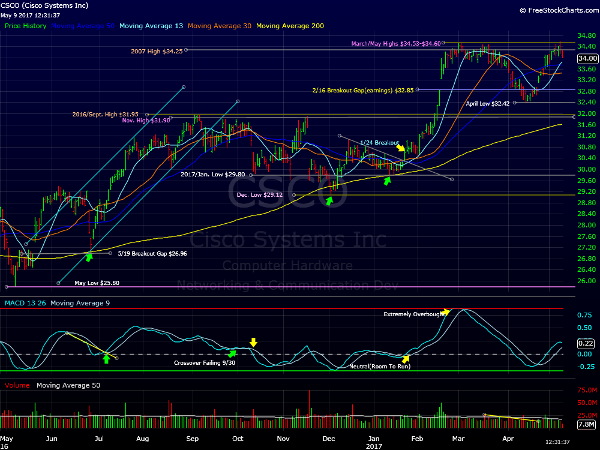 Back in late February CSCO was extending its powerful January 24 breakout. Three weeks later the stock received a major upside jolt following its Feb. 15 earnings report. CSCO gained over 2.3% the next day and by the end of the month the stock was up over 13% from the Jan. 24 open. This impressive rally leg pushed the stock well into overbought territory. Cisco was unable to build on the post earnings breakout after hitting the $34.50 area. This major resistance zone capped the February and March highs but appeared ready to give way last week. After yesterday's reversal and today's weakness a pullback, possibly a deep one, now looks more likely. If the stock finishes this week below last week's low an ugly weekly downside reversal will be in place. Investors should expect more downside to follow. A fade back down to key support near the $33.00 to $32.50 area would offer a much lower risk entry opportunity than currently available.